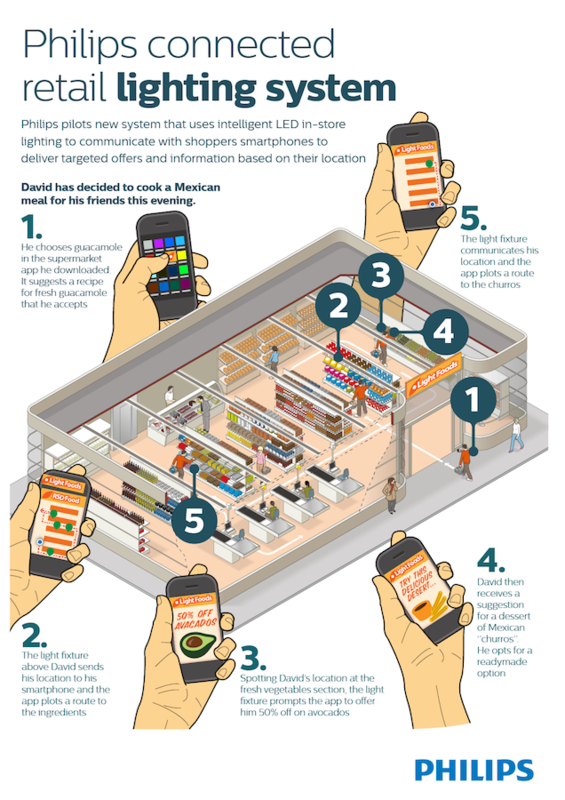 Philips looks set to take on Apple’s iBeacon technology with an intelligent lighting system designed to help shoppers find their way around a store while notifying them of special offers relevant to their location. The technology creates a dense communication network throughout a store via special lighting fixtures, each of which incorporates a location-sensing beacon. These start interacting with a shopper’s mobile device shortly after they enter the premises. Visitors will be able to bring up a map of the store on their display to more easily search out particular items, while location-based offers and information will be transmitted to the user’s phone as they move around the store. Of course, one of the drawbacks is that if your mobile is constantly bombarded with offers, coupons, “alternate recipes” and other information as you make your way around the store, reading and managing all the incoming data may end up turning your visit into an expedition rather than a brief errand, though perhaps with repeated use you’ll learn how to quickly separate the wheat from the chaff. While Philips hopes its system will help store visitors shop more efficiently, retailers could also benefit by building customer loyalty through targeted discounts and an improved shopping experience. Also, having Philips’ energy-efficient lighting installed should mean lower electricity bills at the end of the month. An increasing number of tech firms and developers are looking at ways to help retailers interact with shoppers, with, for example, Apple’s iBeacon micro-location system offering similar features to store visitors, delivered by small transmitters located around the premises.